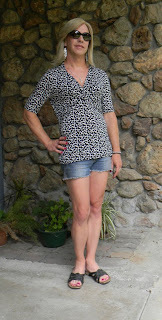 I have been all about the shorts lately, of course with the temperatures generally being above 100 I can hardly believe that I am putting on a wig and going out at all! Today I got dressed and went and visited one of my doctors. It is always kind of a strange thing going to a doctors office while dressed as a woman and telling them my real name! But the receptionist is so cool, she calls me by my girl name. She is such a sweetie! The top I am wearing is an example of what I have been focusing my purchasing efforts on lately. In the past I would go and buy clothes by what looked pretty, not even trying the clothes on. Then I started trying the clothes on and started buying clothes that fit. That was a step in the right direction, but since Jules' and mine last clothing refinement I realized this type of top is generally the style I choose to wear more often than not. It is quite difficult as there are so many other cute clothes out there though! But I have stayed focus and stuck to my new rules. This has meant that I have visited many, many stores and have not bought anything. But I have been able to buy a few things, like the top pictured above, and now instead of just having pretty clothes, I have pretty clothes that fit, and that actually flatter me, and I like to wear them! Wow what revolutionary concepts, I know! - Jules and I got a sheet fed duplex scanner and we are trying to go paperless at home! Exciting! - I actually got kind of harassed while dressed as a girl. Some ignorant dumbass front desk man at a hotel thought he would prove how ignorant he is. I tried to educate him and he didn't care! Funny! I guess that's reassuring that most people you meet in public either don't care or treat you with some respect. When it comes to the occasional ignorant dumbass, if they don't care to open their minds, the best thing to do is just move along. It's nice that you only dedicated three sentences to that story, and many more sentences to positive things. No need to delve too deeply into the thoughts of ignorant a-holes. So true Katie! And really the vast majority of people actually go out of their way to show me lots of respect, which is extra cool! Sieht gut aus, besonders die Shorts gefallen mir.